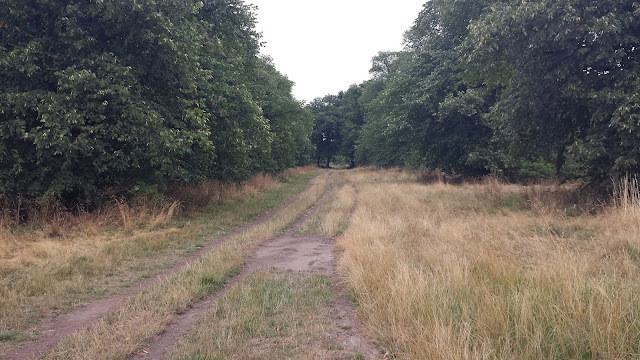 Wanstead Flats is in Redbridge, Eastern London, and actually forms the Southern portion of Epping Forest. 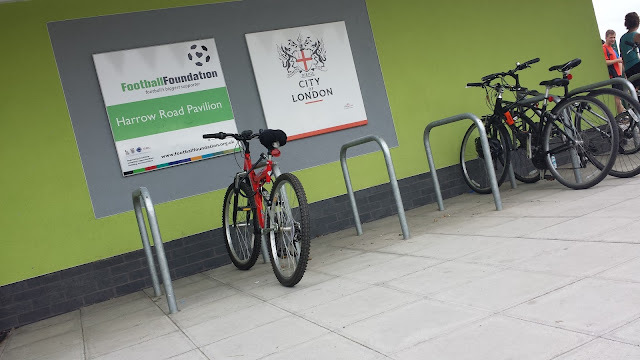 As usual, I arrived at stupid o'clock (7.45am), which was actually way too early as the car park was still locked. Anyway, I was eager to get out and explore the course before the parkrun so I parked on the road opposite. For the record the gate to the car park was opened at about 8.15. Next to the car park is Harrow Road Pavilion, which is the meeting point for the parkrun. Here you'll find the registration desk, the bicycle racks, the toilets and the cafe. 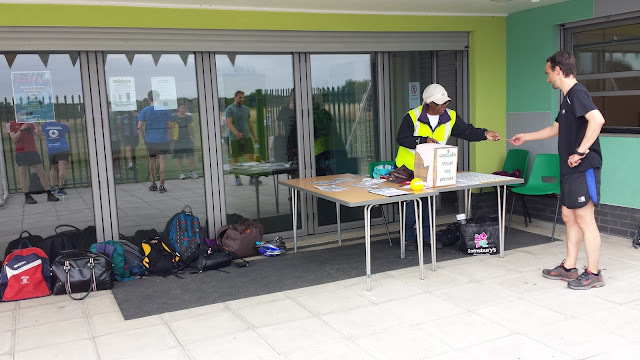 So after a recce of the course, I returned to the pavilion to listen to the pre-run briefing, after which we were all walked across to the start line. 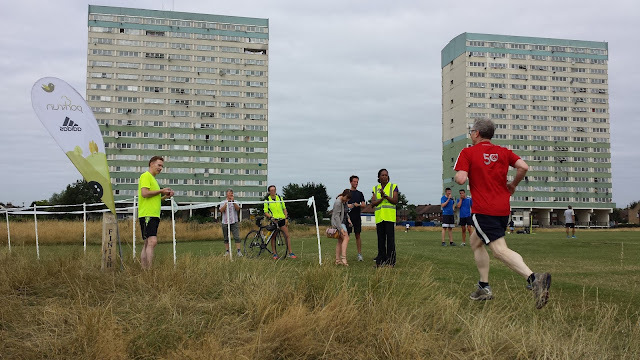 Something that really impressed me was how intergrated the parkrun is in the fabric of the park. As you can see in the photo above, the start line has a proper permanent wooden start post. 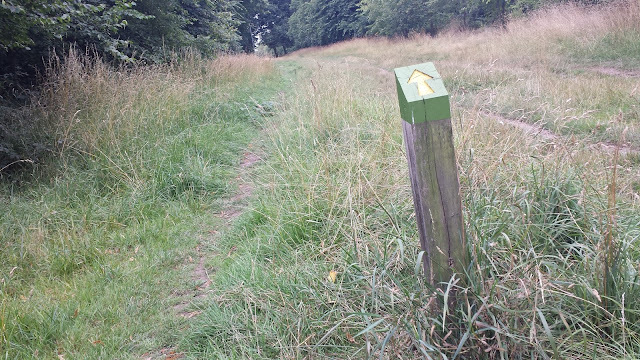 Plus the course is fully way-marked with directional arrows on wooden posts. For the purpose of the parkrun, the volunteer team had also attached the standard parkrun direction arrows to the posts. 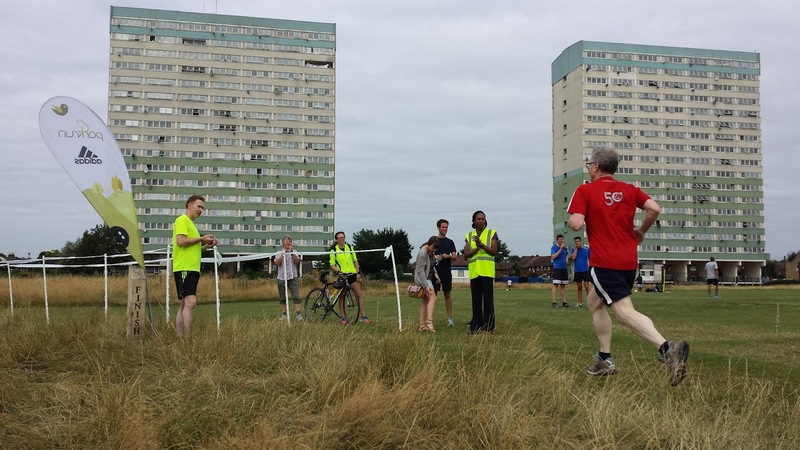 The run starts on open grass and follows the perimeter of the sports pitches, which are overlooked by two extremely imposing run-down tower blocks. 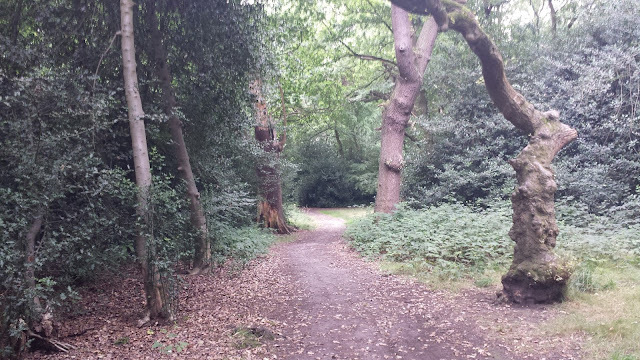 After a few hundred metres the course takes you away from the open area and into 'The Avenues', which is fairly wide and the surface changes to be more trail-like. 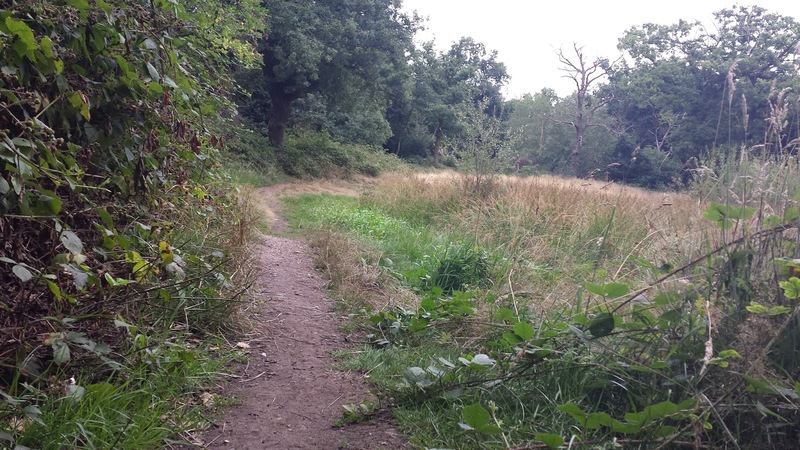 After 400 metres or so there is another change of direction when the course turns left for a loop around a pond (but I didn't see any water on the day I ran here) which is within the forest and I felt like I was running through trails in the countryside. 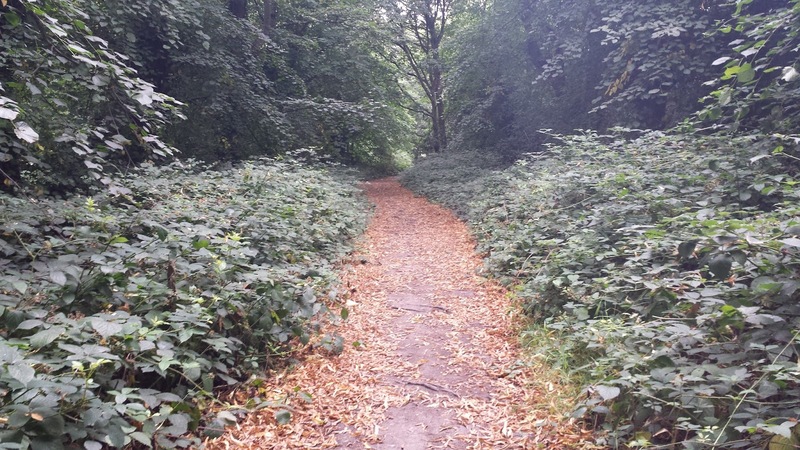 Here the trail narrows and it's single file for a few hundred metres. According to Google maps there is also burial ground here, but I didn't spot anything. Once the loop of the pond has been completed the course goes back along part of the 'The Avenues' before turning left along a short stretch of tarmac path. 20 metres or so later the surface returns to trail as you pick up a path that runs along the back of what seems like some nice houses - be careful here because this path is also used as an access road to the garages at the rear of the houses. At the end of the path the course does a little shimy and delivers you back onto the grass playing fields. You then follow the perimeter until you arrive back at the start area. That's 2.5km done, just one more identical lap and you can cross the finish line (again, it's marked by a proper wooden post). As the name suggests, the course is completely flat. You could get round with a buggy but there are some points around the pond where the path is exremely narrow and uneven so I would proceed with caution at this point. It's worth looking out for obstacles as I witnessed a runner in front of me tumble head over heals when his foot caught a branch that had fallen onto the path and was obscured from view by some longer grass. It's also worth pointing out that at the time of writing the official course map is not 100% correct as it does not show the turn onto the tarmac path and route along the access road - instead it suggests that you come back out onto the open grass area much earlier than you actually do. Wanstead Flats parkrun is definitely a place of extremes - the povery stricken tower blocks on one side and the rather nice looking houses on the other, and also the London location with countryside feel to the course. 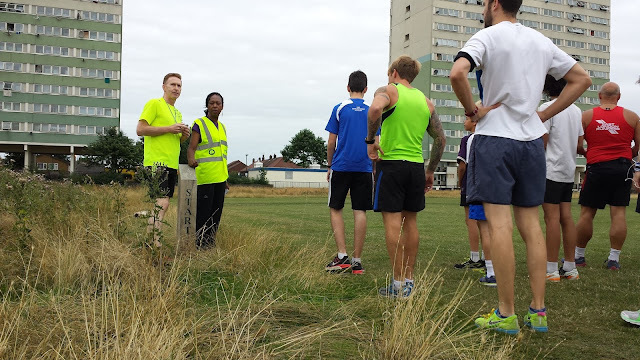 I thoroughly enjoyed it and would defintely put this on the list of parkruns to return to. I'd also add that this course will be a huge amount of fun when the weather turns and it gets muddy!